Ahlen, September 2011. 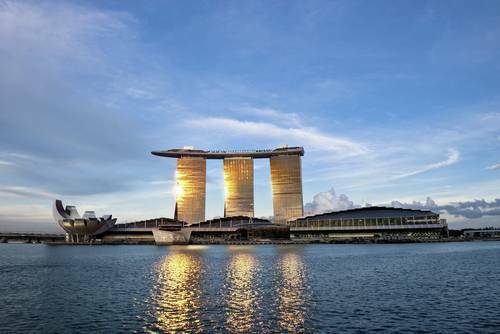 – The Marina Bay Sands Hotel in Singapore has the very highest standards in architecture, design and luxury. The hotel, which was opened in 2010, consists of three towers that are connected to each other by an expansive roof terrace 191 m above the ground. In order to compensate for the movements of the towers caused by the wind, expansion joints of up to 500 mm width have been inserted between the three linked swimming pools on the roof terrace. As well as the hotel, the site includes numerous restaurants, boutiques, a casino and two theatres – all at the very heart of Singapore. The internationally renowned architect Moshe Safdie was commissioned to design the vast construction project. Like the exterior of the hotel, the interiors of the rooms and suites are in a balanced composition of the most exclusive materials, and designed to provide the ultimate well-being for the hotel’s guests. 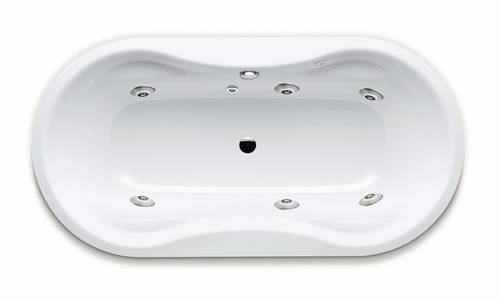 The bathrooms in the VIP suites are furnished with Kaldewei Mega Duo Oval whirl baths with the Vivo Turbo system. They guarantee the guest an individual relaxing whirl bath, while at the same time being perfectly designed to meet the hygiene requirements of a hotel. The vast, €5 billion building project was commissioned by the Las Vegas Sands Corporation and carried out by the renowned architect Moshe Safdie, whose other projects include the Salt Lake City Public Library in the USA and the Yad Vashem Holocaust Museum in Israel. The hotel complex consists of three 55-storey hotel towers with a total of 2560 rooms. Safdie found the inspiration for his construction project in ancient cities, and created an urban structure in which the hotel complex offers numerous possibilities for living, shopping, dining and entertainment, aligned along two road axes that divide the site and provide orientation for guests. The roof terrace, called the SkyPark, covers all three towers and links them to each other. The observation deck is situated on a 65 m long cantilevered boom, and can accommodate 900 people. The total length of the terrace is 340 m. Visitors can enjoy the breathtaking panoramic views of Singapore and the impressive skyline of its financial district. The infinity pool on the terrace consists of three linked pools totalling 151 m in length, and creates the impression of being able to swim straight into the horizon. The SkyPark incorporates the green element in its urban design concept with the garden of 250 trees and 650 plants. The suites appeal for their luxurious design, fabulous views of the city and Marina Bay‘s beautiful park. The interior design was the work of Hirsch Bedner Associates (HBA), and was carried out in close cooperation with the architect Moshe Safdie. The designer team at HBA created more than 100 different room types, all based on the arched shape of the towers. Great care was taken to create an independent room harmony that is repeated in every room, and integrates the guest in the concept as a further element in the architecture. Only the very highest standards of comfort were used in every room, which is expressed in the use of local materials, elements and details. One wall in every room is all-glass, which gives the room a completely different flair by night. It was extremely important to the HBS designers to integrate Asian elements in the room design. The design elements that were used are a homogeneous mixture of Chinese, Malay, Indian and western influences, which also reflects the multicultural society of the city state Singapore. The soft, ergonomic lines of Kaldewei’s Mega Duo Oval whirl bath blend perfectly with the design concept of the fusion of Asian and western influences, enhancing the luxurious design of the bathrooms in the VIP suites. The bath is made of Kaldewei steel enamel. Thanks to the additional pearl effect, bacteria and dirt are unable to adhere to the smooth, rock-hard surface of the bath, so cleaning it could not be easier. The anti-slip function guarantees absolute safety when getting in and out. The Vivo Turbo jets used in the bath increases well-being with their unique whirl technique, which only Kaldewei uses in this form: each of the six vertical jets draws in up to 108 l water per minute, which then swirls back out again as a massage jet. The jets are infinitely variable. From smooth, gentle stroking movements that stimulate the sensory hairs to a strong, all-over massage of the dermis, hypodermis and musculature, the Vivo Turbo whirl system offers individually tailored wellness. The jet system works without pipes, which means no residual water is left where dirt and germs could settle. The jets empty automatically after the bath. All of the whirl bath components that come into contact with water are easy to clean with the hand shower; there is no need to use any chemicals. This very high level of hygiene is of particular importance in hotels. Tremendous savings in time and money can be achieved over conventional whirl systems. Exclusive design, successfully combined with optimum functionality – as it is in the entire concept of the Marina Bay Sands Hotel. 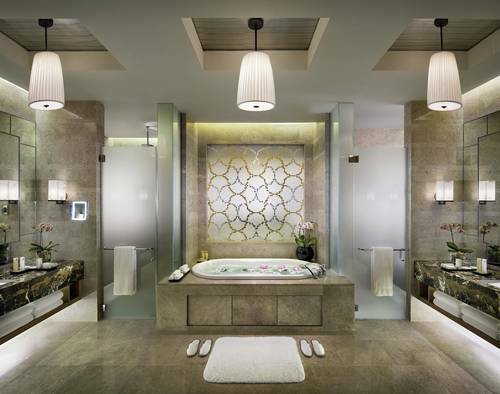 The bathrooms of the VIP suites at the Marina Bay Sands Hotel are furnished with Mega Duo Oval whirl baths with the Vivo Turbo system. The bath and whirl system offer exclusive design, and meet the highest standards for hygiene. The Marina Bay Sands Hotel consists of three 55-storey towers with a total of 2560 hotel rooms. The 340-m long roof terrace is 191 m above the ground, and includes a garden, an infinity pool and an observation deck on a cantilevered boom with views of the skyline of Singapore’s financial district. The Mega Duo Oval is made of Kaldewei steel enamel, and has the dirt-repellent pearl effect finish. The two wide armrests on the sides enhance comfort when reclining. Each of the six vertical jets of the Vivo Turbo whirl system draws water in before swirling it back into the bath as a massage jet. This means the system requires no pipe connections at all, so there is no need to disinfect the whirl system.